…When ideas flow like water. Yesterday, I woke up and started getting ready for work. I started the Keurig machine (best.investment.ever), went downstairs to feed the cat and went back up to start the second half of my travel mug of coffee. As I was standing there, my brain starting working on why I should introduce Orcs to my world (inspired by Satis’ comment of having a purpose for having a race present). So my mind wandered a little bit down that track and Bam! 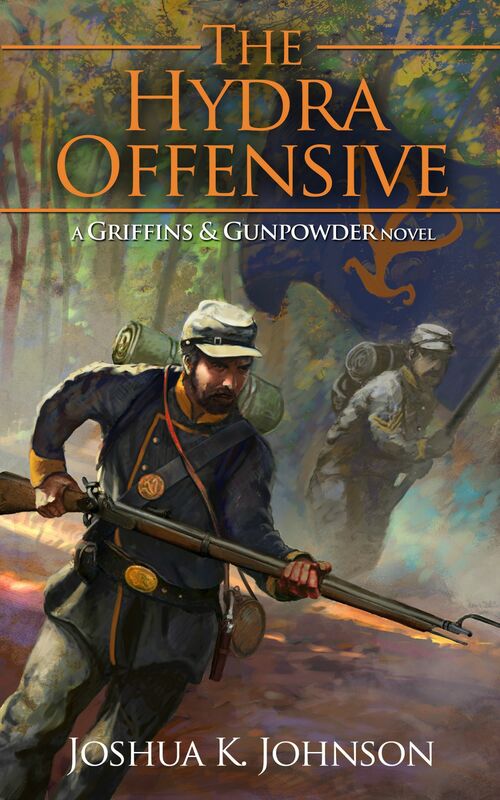 an idea for another series set in my Griffins & Gunpowder universe (that would make 3). I liked the idea so I opened up my Evernote app and tapped out a few quick details and started off to work. It’s about a ten minute drive to work and I wasn’t even halfway there when another G&G series idea slammed me. And then another. And then a third. I was incredibly excited! I just had four new series ideas come out of nowhere, essentially tripling the number of series I could work with in my universe. As soon as I got to work, I fiendishly tapped my ideas into evernote and then got to work, but my brain was still buzzing with creative energy and my stories started to add details and ideas to themselves. And then another series wandered along and made itself known. I think that I can honestly say that yesterday was one of the most exciting and creative days I’ve had in a while. Have you ever had a day when your brain won’t shut off and the ideas come out so quickly? 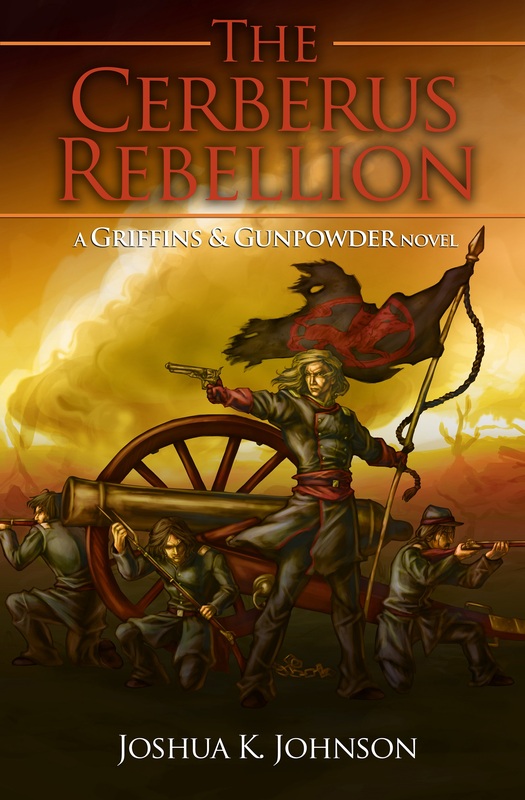 So that’s the finalized cover for The Cerberus Rebellion. I want to thank Heavycatweb.net for their awesome work in turning my idea for a cover into reality. And thanks to my wife for doing the typography! Over this weekend I’ve been working on editing the short stories that will be accompanying The Cerberus Rebellion. I had previously planned to release these 4 shorts as a collection, three of them as singles as well, an release two novellas as well. However, I don’t think that ill be able to get the short stories written and edited in time to make a simultaneous release. So I’ve adjusted my plans: I’ll be releasing The Cerberus Rebellion, The Red Dragon’s Gold, The Sithean Betrayal, The Gathering Storm and the collection Invasions of the Red Dragon (including a bonus short story: The Dragon’s Prelude) in early July if everything holds to plan. When The Griffin’s Heart and The Battle of Broken Plains are complete and edited, ill be releasing them at intervals while I work on The Hydra Offensive. This way, ill have fresh content to keep my name out there! If it works out, I’ll probably do this with The Hydra Offensive and its accompanying stories. What’s your plan for keeping your name fresh while you work on your next major release? I was reading about the Amazon Associate program and how, once I get my books rolling, it would help me by increasing my income from sales generated by my website by a few extra percent. So I went onto the affiliate program website to sign up and get “Residents of IL are not eligible”. A quick google search revealed that because the Illinois government decided to try and force affiliates to collect sales tax for e-commerce, Amazon was forced to pull the program. Really, Illinois? I’ve been spending a lot of time recently pondering my situation and reading the thoughts of others (like Russell Blake, for instance). What have I been pondering, you might ask? Well, the dilemma of getting exposure and selling more books. With The Cerberus Rebellion in the hands of my beta-readers and 3/4 short stories finished, I’ve been working on plotting out the character arcs for my main characters over the rest of the series (right now, 5 more novels). When I first developed the general idea for where I wanted this series to go, I had a pretty solid idea for how I wanted each character to end up. As the first novel developed, however, my long term goal for person shifted. My plot, as it stands now, is radically different from what it was. First off, I had to kill an important secondary character in order to nudge one of the main characters down a certain path. As I’ve developed the arcs for the series, I’ve realized that at least one of my POV characters needs to die at some point toward the end of the series to bring closure. This is really the first time that I’ve considered killing off a main character. In all of my other works, the main character comes through at the end. I think the catalyst for this change of perspective was reading the Song of Ice and Fire books by George RR Martin. I won’t spoil it further than saying that he doesn’t mind killing off fairly important people. I think that the multiple POV approach to writing provides the backup necessary to be able to kill off main characters because new ones can slide right into place and the other POV characters can continue the story. When I initially killed off this secondary character, I went back through and read all of the chapters that he/she were involved in and realized that there wasn’t much to attach the read to him/her. So I went back through and beefed up this characters involvement in the story and the interactions with MC(s). I haven’t received any feedback yet, but I’m hoping that my re-work of the character provided enough substance to make their death felt. So what’s your opinion on killing off primary or important secondary characters? The world of writing has evolved extensively, even in just the past few years. I still remember the first story that I wrote. I don’t remember how it went, or how it ended, but I do remember it was a short story for school and involved castles. I wrote it on my dad’s dos computer that had like 64kb of ram, in the basement office that he had set up. When I started to extensively write, I was 12 or 13. We were getting ready to move an hour away from civilization and I was homeschooled, so I needed something to occupy my time. I started having my parents buy me pens and 5 subject notebooks and I went to town. I still have those notebooks, all 30 of them, in my basement. Most of them are terrible, terrible things that are really just a combination of ideas taken from books, comics and games and adapted to my own universe. As I grew older, I started developing my own ideas and worlds, but I still wrote on paper. It wasn’t until maybe 6-7 years ago that I wrote nearly exclusively on a computer. But, I still used paper and pen for when I was away from my computer or just to jot down ideas. Even now, I find myself grabbing a piece of scratch paper and a pen when I’m at work and an idea hits me. It’s something about the scratch of the pen as I drag it across the paper that gives me the satisfaction that the tap-tap-tap of a keyboard doesn’t. So with all of the options for writing in this modern era of smartphones, tablets and ultra-thin laptops, do you still find yourself scratching out ideas on paper or have you gone over to the completely-electronic world? With The Cerberus Rebellion in the hands of beta-readers, I’ve turned my attention to writing and alpha-editing the short stories and novellas that will accompany it as part of my first set of releases. So far I’ve finished 3 of 4 of my planned short stories and have set about editing them so I can get them beta’d. For me, it has been difficult to write short stories that are meant to be both independent stories but also serve as worldbuilding pieces for my overall universe. I find working enough worldbuilding into the stories to make them viable standalones while not infodumping the reader to be a delicate balancing act. The process that I’ve developed is to write on a minimalist scale and only feed the information into the story that is essential to the story. When I go back through editing, I write down every proper name, nations, people or events, and make sure that the questions “Who?/What?/Where?” are answered for them. So far I’ve found a couple of places that needed to be tweaked, but I think this will help walk the line between too-little and too-much.